Thomas Brinkmann is an acclaimed conceptual electronic musician based in Cologne, Germany. 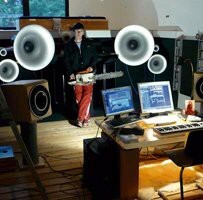 He began experimenting with carved-groove records in the 1980s while studying visual art at the Düsseldorf Art Academy. In the mid-90s, using a custom-engineered, two-arm turntable, Brinkmann constructed full-length “variations” of techno albums by Mike Ink and Richie Hawtin. He is also known for /Klick/ – a series of percussive dance music performances, begun in 2000, in which he cuts and scratches the surfaces of vinyl LPs. Brinkmann has exhibited and performed at venues, galleries, and museums all over the world and has released over 50 records and CDs of experimental and electronic music, including 2015’s acclaimed /What You Hear (Is What You Hear) /on Editions Mego.